This product is no longer available and has been replaced by: CSAT3B. Some accessories, replacement parts, or services may still be available. 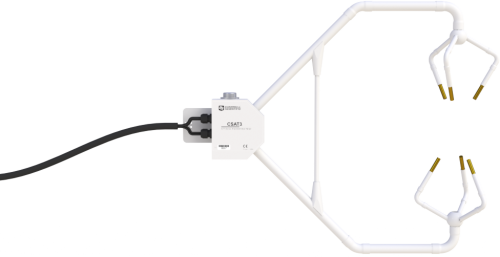 The CSAT3 is a three-dimensional sonic anemometer that measures three orthogonal wind components and the speed of sound. In eddy covariance systems, it can measure the turbulent fluctuations of horizontal and vertical wind. These measurements are then used to calculate momentum flux and friction velocity. This sonic anemometer can also provide average horizontal wind speed and direction measurements. The CSAT3 comes with 25 ft cables. The FW05 fine wire thermocouple (12.7 μm diameter) is available as an option for fast response temperature measurements. Speed of Sound Determined from three acoustic paths; corrected for crosswind effects. Measurement Rate Programmable from 1 to 60 Hz, instantaneous measurements. Two over-sampled modes are block averaged to either 20 Hz or 10 Hz. Resolution values are for instantaneous measurements made on a constant signal; noise is not affected by sample rate. Offset error and gain error values assume the -30° to +50°C range, wind speeds of < 30 m/s, and wind angles between ±170°. Speed of Sound 300 to 366 m/s (-50° to +60°C) Least significant bit is 1 mm/s (0.002°C). PC support software for monitoring and configuring the CSAT3. Is there a way to determine the time at which the CSAT3 started reporting data with sub-second precision? No. The CSAT3 does not report time with the wind measurements. A time stamp will be assigned to the wind data by the data acquisition system—either a data logger or a PC. If the polymer coating at the ends of the CSAT3 transducers starts coming off, is that a problem? Yes. If the matching layer is damaged or missing, return the CSAT3 to the factory for repair. Follow the steps listed on our Repair and Calibration page to request a returned material authorization (RMA) number. Can the CSAT3 measurement frequency be changed? If so, what frequencies are supported by the CSAT3? Yes. The CSAT3 measurement frequency can be changed by the user. It is set by the Execution Parameter. This parameter is described in detail in the CSAT3 instruction manual in the “Datalogger Instruction Parameters” section, as well as in the “CSAT3 RS-232 Commands” section of Appendix B.